SB397 Eddy Co, NM. 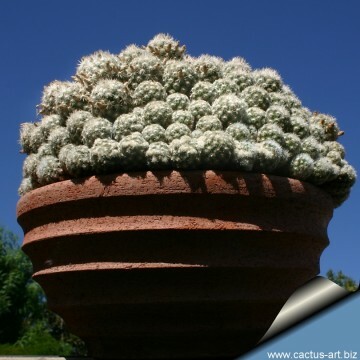 USA - In cultivation the Escobaria sneedii v. leei will form beautiful large mounds with hundreds of small heads. Origin and Habitat: USA (New Mexico, Eddy County, Guadalupe Mountains) This species is listed as threatened, but it is quite frequent in its very small area of distribution. It is popular with collectors and has been subject to commercial collecting in the past, but is now propagated commercially on a large scale and is readily available and very common. Habitat: Primarily it occurs on the tops of limestone ridges in areas of broken terrain, terraces, rim rock or in poorly developed limestone soil, the majority of the plants grow in cracks in the rocks on north-facing slopes between 1,400-1,800 m in elevation, rarely under cover, usually sparsely distributed among the shrubby vegetation of the high Chihuahuan desert (Shrub and interior Chaparral ), a plant community dominated by large almost arborescent shrubs such as Dasylirion wheelerii and Yucca torreyi in association with Muhlenbergia, Agave lechuguilla, Opuntia phaeacantha, Dalea sp. and Berberis trifoliolata. Escobaria leei Rose ex Boed. 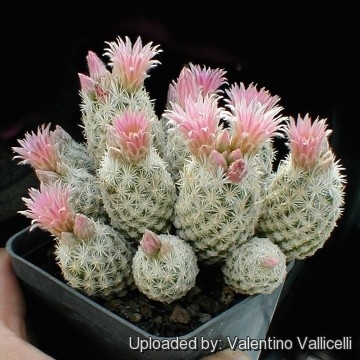 Mammillaria leei Rose ex Boed. 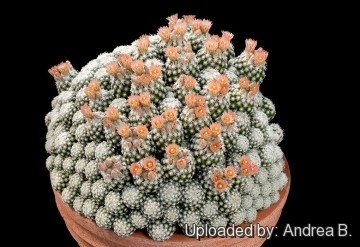 Description: Escobaria sneedii subsp. leei grows in dense clusters with as many as 100 or more stems in a clump. Stem: Spherical at first, later mostly club shaped, sometimes cylindrical, branching and proliferating very rapidly, forming irregular clumps, each individual stem is 1,5-6(8)cm tall and 1-2,5 cm in diameter. Tubercles: Tightly packed cylindrical 2 mm long, often smaller with upper surface grooved on mature stems. Areoles: Circular or elliptical on tips of tubercles often elongating into grooves from spiny portions at ends of tubercles to about halfway to tubercle bases; flowers and branches come from ends of grooves; at first very woolly, wool remains in grooves; centre of spiny part often very convex, bulging outward, with spines mostly pushed back, radiating and forming convex areole centres, giving unique, knobby appearance. Many stems remain with unelongated areoles, sometimes through-out life of stem. 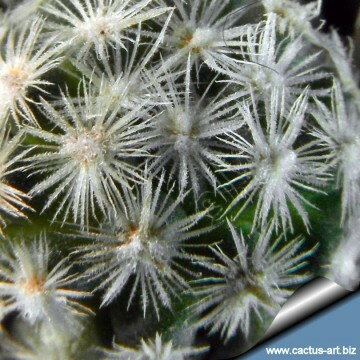 Radial spines: 30 to 90 very small, typically white often brown at tip, fading to grey, slender and bristle-like, mostly about 1-2,5 mm long, radiating from areole and appressed against plant. Central spines: Sometimes with one to 7 short porrect stouter centrals, white or with pale brownish tips, usually about 3 mm long, a few may be longer; 1 central perpendicular to plant in centre of areole, may be very short; others radiating in front of radials. Roots: Fibrous when young, or sometimes with a single definite, fleshy tap-root, which runs some centimetres before reducing. Flowers: Brownish-pink in early April-May. Showy but small, usually not opening widely, 1,2 cm long up to 1,5 cm wide; outer tepals brown or greenish-brown with light edges fringed; inner tepals brownish-pink (rarely pale yellowish, or whitish) in colour, usually with deep pink midstrip, edges lighter and entire. Style white longer than stamens with 4-6 short white stigma lobes. Fruits: Small elongate, 1-1.5 cm long, greenish tinged with brownish or faintly pinkish when ripe to somewhat reddish, sometime with a few hairy scales, floral remnant persistent. Seeds: About 0,8-1 mm long and 1,5 mm broad, kidney-shaped or less pear-shaped, pitted, dark brown, with hilum lateral. Remarks: The subspecies leei differs from other Escobaria in densely its clumping habit, small stem size, and tightly, almost pectinate, spination. The wild population intergrades with other forms of Escobaria sneedii in the Guadalupe Mountains. This is apparently a neotenic variety of the species in which juvenile spination is retained throughout the life of the plant. This species is closely related to Escobaria sneedii var. 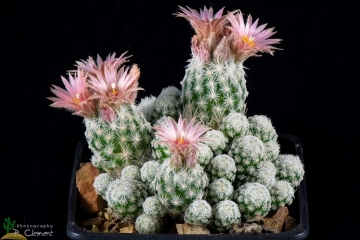 sneedii from which it differs by having deflexed spines, rather than spreading ones, brownish - pink flowers as opposed to rose-magenta ones, and seeds 1 mm long as opposed to 0,75 mm in length. Escobaria organensis (Zimmerman) Castetter, P.Pierce & K.H.Schwer. : it is less white with central spines yellow, tips often reddish brown and has a large average stem diameter. Distribution: Northern Franklin Mountains and the southern part of the Organ Mountains. New Mexico. Escobaria sneedii Britton & Rose: has 6-20 central spines white with dark tips up to 30 mm long, radials 20-55 bristle-like white. Flowers pink. Distribution: Franklin Mountains (west Texas) and Florida and Guadalupe Mountains (southern New Mexico). Escobaria sneedii subs. leei (Rose ex Boed.) D.R.Hunt: has 30-90 radial spines about 1-2,5 mm long, white often brown at tip, sometimes with one to few short centrals. 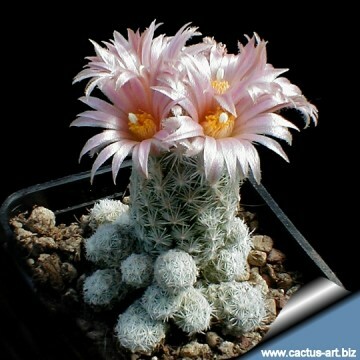 It is a neotenic form of Escobaria sneedii. Distribution: Eddy County, Guadalupe Mountains, New Mexico. 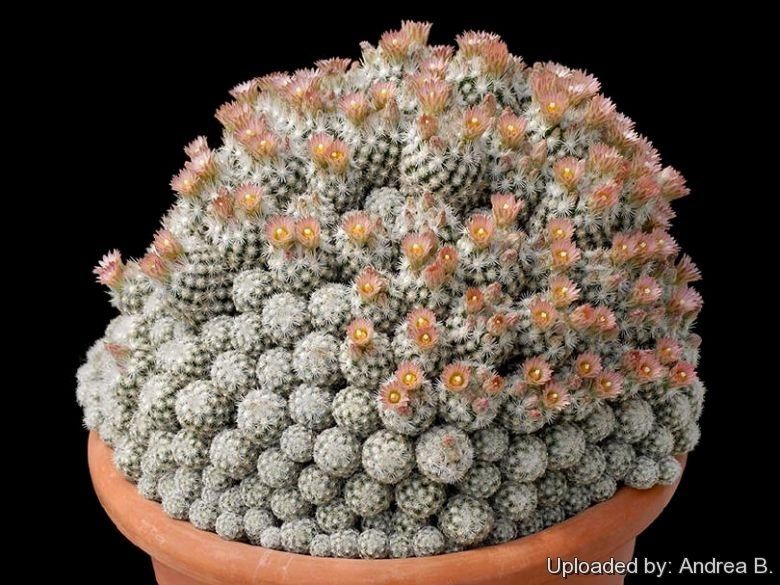 Coryphantha sneedii var. leei (Escobaria sneedii subs. leei) Photo by: Andrea B.
Cultivation and Propagation: Escobaria sneedii subsp. leei comes from an area of summer rainfall and is supposed to be not the most easiest species in cultivation, as particularly sensible to moisture excesses. It will offset profusely. Soils: Use a an open and free draining mineral compost with little organic matter (peat, humus) that allows therefore roots to breath (as it is rot prone). Repotting: Repotting every 2-3 years. Use a small pot with good drainage. Watering: It likes a winter's rest and should be kept completely dry during the winter months. From early spring onwards the plant will begin to grow and watering should be increased gradually until late spring when the plant should be in full growth. Water regularly during the summer so long as the plant pot is allowed to drain and not sit in a tray of water. During hot weather you may need to water the plants more frequently so long as the plant is actively growing. From late summer watering should be reduced to force the plant to go in to a state of semi dormancy, by autumn you should be back in to the winter watering regime. Keep dry with ample airflow in winter (but for outdoors cultivation it is very resistant to wet conditions, too). In the rest period no high atmospheric humidity!! Care must be taken with watering as they tends to become swollen and untidy in growth habit if given too much water and shade. Hardiness: Reputedly resistant to frost if kept on the dry side prior to, and during, cold weather (hardy to -17 C ° C, or less for short periods). 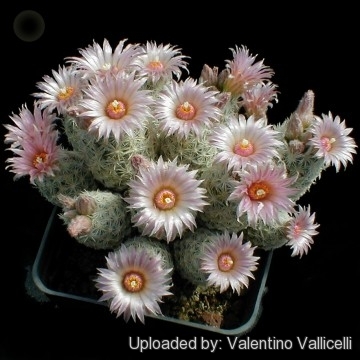 Exposition: The plant tolerates very bright situations, if kept too dark they may become overly lush and greener and could be prone to rotting due to over watering. Strong light encourages flowering and heavy wool and spine production, but is likely to suffer from sun scorch or stunted growth if over exposed to direct sunlight during the hottest part of the day in summer. .
- Rot: This species seldom suffer of cryptogamic diseases. 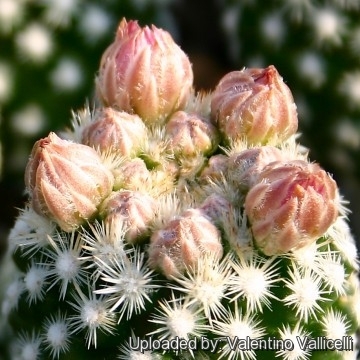 Rot it is only a minor problem with cacti if the plants are watered and “aired” correctly. If they are not, fungicides won't help all that much. Propagation: Direct sow after last frost or usually by offsets (readily available), or occasionally grafted. Seeds (no dormancy requirement) germinate in 7-14 days at 21-27° C in spring, remove gradually the glass cover as soon the plants will be well rooted (ca 1-2 weeks) and keep ventilated, no full sun for young plants! The seedlings should not be disturbed until they are well rooted, after which they can be planted separately in small pots. Cuttings: wait until the offsets that appear at the base of old clustered specimens are 1/3 the size of the parent and then detach and plant.